Dead Sea salt is one of the richest sources of magnesium. It comes in the form of magnesium chloride, which is considered by experts to provide magnesium which is more easily available to the body since it is absorbed more easily through the skin. The Dead Sea as it is today was formed over billions of years, as a result of continuous evaporation of sea water, which has happened because the sea has no connection with the ocean at present time. The Dead Sea is one of the most ancient seas on Earth, based 400 metres below the sea level. 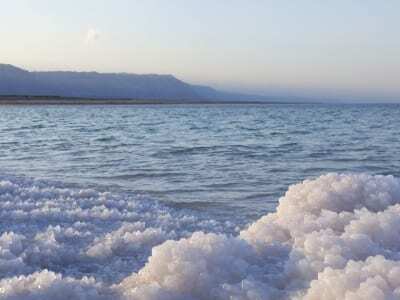 The process of evaporation of the water from the Dead Sea has produced a phenomenon which lives up to its name since no life can survive in the highly saline environment of Dead Sea. High mineralisation of the sea has been used by people for hundreds of thousands of years, with the popularity of Dead Sea growing steadily. It attracts countless numbers of health tourists wishing to improve their joint mobility, address skin problems, nervous complaints, rejuvenates, and simply relieve stress and “recharge batteries”. The Dead Sea has given us two famous products – the salt and the mud, which are used extensively on their own, as well as ingredients in health and beauty products. The Dead Sea is incredibly rich in minerals and numerous other precious substances and has a very high level of magnesium. It also contains all the essential elements of the Periodic table which are encountered and used by the body and countless other precious substances. Extensive scientific research has demonstrated excellent results for its effectiveness in the treatment of various skin problems such as acne, psoriasis, dermatitis, eczema. Because of its high levels of magnesium and bromide, the salt has been used widely to treat nervous disorders and musculoskeletal complaints, such as arthritis, as well as inflammatory conditions of all body systems. Cosmetic/ beauty products ingredient – add as required.